There is a series of spontaneous poetry readings happening on the northeast side of LA. 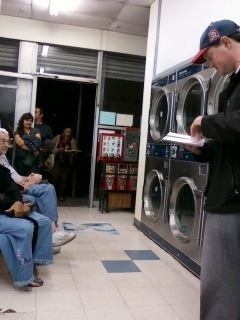 Last night I went to my second installment at a laundromat–it was called Dirty Laundry. The first reading I went to (this summer) was at a taco shop with The Taco Shop Poets coming in from their various places in California to read and have tacos. None of the poets last night washed dirty laundry. Both times I attended, I knew I was going to hear poetry, both times I was surprised by the venue. In fact, each time I could not figure out the address as I circled the block various times, because I was looking for an art space, not a mom-and-pop business. After seeing so much art, good and bad, surprises are a treat. These take-out poetry readings are a gift of Kathy Gallegos, Director of Avenue 50 Gallery and Studios in Highland Park. Her smile and genteelness welcomes you when she hands you a bookmark printed with the evening’s poetry selections on it. Great keepsake. As a curator, I am always concerned with the affect of art on an audience. At the laundromat, like the taco shop, patrons are there to take care of mundane duties, take a break, relax. As one of the poets said last night, the laundromat is a sacred space, an escape from matters happening at home and a place to think quietly with the impartial hum of machines in the background. I wonder if these poetry invasions cut into the harmony of the environment or if they shake it to a higher level? Seeing the children scurry under the poets from one side of the room to the other, the loud music score of the Pac-man game start up in a back corner, tipsy men chatting loudly about some bronca, the attendant assisting customers, the poets not skipping a beat–somehow it all worked together. I looked away from the poets to my right and noticed two elementary school siblings sitting on the bench next to me, quietly listening to words above their age levels. I smiled remembering my first desvelada when I accompanied my dad to Corona, California to give our elderly tia a surprise mañanitas serenade on her milestone birthday. I remembered her joy beyond smiles when she came to open her front door in pajamas. Growing up I loved hearing my father play his guitar and my mother sing, it was the home training I received that made me an artist. I think now, that I would have loved to have heard poetry too, even if I did not understand or expect it. Newer: 1938, I Feel You.